When asthma and acute bronchitis occur together, the condition is called Asthmatic Bronchitis. · Improves self defense mechanism of the body. · No side effects of medicines. · Helps in reducing the frequency and severity of subsequent attacks. · It reduces the need for bronchodilator, cortisone, inhalers, and antibiotics. · It improves overall health. · It is absolutely safe and can be taken along with the conventional medicines. Bronchitis and asthma are two inflammatory airway conditions. Acute bronchitis is an inflammation of the lining of the airways that usually resolves itself after running its course. It's caused by viral or bacterial infections. Chronic bronchitis, which is longer lasting, can be triggered by long-term exposure to environmental irritants such as tobacco smoke, dust, or chemicals. Asthma is an inflammatory condition that leads to tightening of the muscles around the airways and swelling that cause airways to narrow. The symptoms of asthmatic bronchitis are a combination of the symptoms of bronchitis and asthma. Bronchitis itself can be caused by a virus or bacteria, which are contagious. 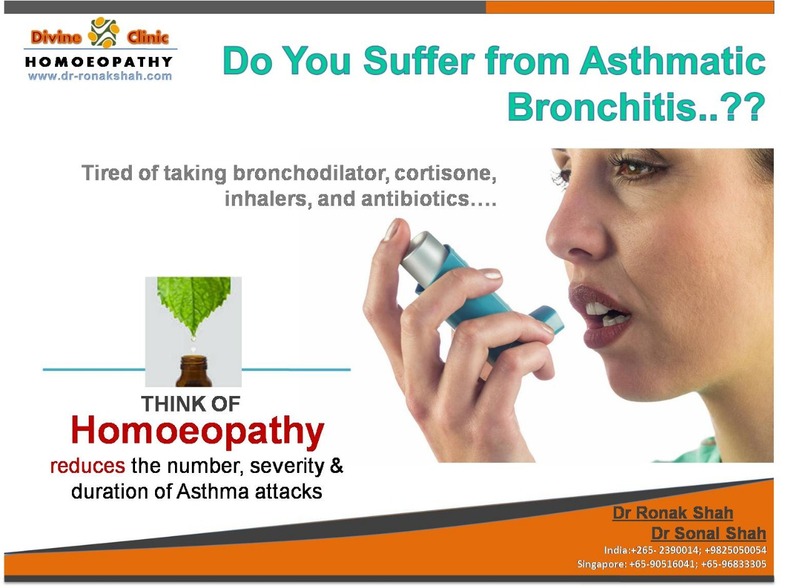 However, chronic asthmatic bronchitis typically is not contagious. · Spirometry. A test that measures lung function as you breathe in and out of a mouthpiece that is attached to a device called a spirometer. · Peak expiratory flow. A test that measures the force of air you breathe out (exhale) into the mouthpiece of a device called a peak expiratory flow meter. · Chest X-ray. A radiology test that produces images of the chest to look for evidence of other conditions that could be causing your cough and breathing problems. · Wash your bed linens and blankets in hot water. · Dust and vacuum regularly. · Use a HEPA air filter in your home. · Keep pets out of your bedroom. · Don't smoke, and try to stay away from other people who smoke. · Wash your hands frequently to prevent the spread of infection. · Potential food allergens like milk, eggs, nuts and sea food. · Food additives like monosodium glutamate (aji-no-moto), which is used in Chinese food; and sodium metabisulphite found in beer, wine, dried fruits. · The yellow colouring agent- tartazine. · Rice, sugar, lentils and curds. · Fried and other difficult to digest foods, strong tea, coffee, alcoholic beverages condiments, pickles and sauces. · Honey: honey is one of the most common home remedies for asthma. It is said that if the jug of honey held under the nose of an asthma patient and he inhales the air that comes in contact with it, he starts breathing easier and deeper. The effect lasts for an hour or so. Take 1 or 2 teaspoon honey in warm water daily 2 times. Honey thins out accumulated mucus and helps its elimination from the respiratory passages. It also tones up the pulmonary lining and thereby prevents the production of mucus in the future. · Figs: figs give comfort to the patient by draining off phlegm. 3-4 dry figs should be cleaned thoroughly with warm water and soaked overnight. They should be taken first in the morning, along with water in which they were soaked. This treatment may be continued for about two months. · Lemon: the juice of lemon, diluted in a glass of water and taken with meals gives good results. · Ginger: 1 tsp of ginger juice + 1 cup of fenugreek (methi) decoction + honey to taste = 2 times daily. It acts as an excellent expectorant. (the decoction of fenugreek can be made by mixing 1 tbsp of fenugreek seeds in 1 cup of water). · Garlic: 10 garlic cloves, boiled in 30 ml of mil taken once daily., an excellent remedy for the early stage of asthma. 1. Sambucus nigra treats asthma in babies and children. The child has difficulty breathing, turns blue and gasps for air. The nose is dry and blocked. Excessive perspiration is experienced. 2. Squilla treats bronchial asthma accompanied with involuntary urination. 3. Antimonium tartaricum is an effective remedy in the treatment of bronchial asthma. Symptoms include spasmodic coughing, shortness of breath, asphyxiation, and difficulty breathing. 4. Lachesis treats an asthma attack that arises during sleep or on rising. A nervous cough that gets worse from pressure to the chest or neck. The person wears loose clothing. Physical or mental exhaustion is felt in the morning. 5. Kalium bich relieves the hyper production of mucus. The condition ameliorates by bringing up thick phlegm. 6. Kalium carbonica treats severe bronchial asthma caused by emotional disturbances. Stitches in the chest after lying down, worse from 3 to 4 a.m. Feels better doubled over. 7. Phosphorus is indicated in the treatment of bronchial asthma caused from atmospheric temperature changes. Symptoms include accumulation of mucus in the bronchi, difficulty breathing, and the sensation of heat in the chest. 8. Caladium treats a smoker's asthma. 9. Bryonia relieves an oppressive cough with stitching pains in the chest. The person cannot bear to move or take a deep breath. A great desire to be left alone, and not disturbed. 10. Ignatia calms a nervous bronchial asthma. The person is full of suppressed grief. A slight contradiction will bring on asthma attack. Feels sleepy after the attack. 11. Moschus treats a nervous asthma accompanied by dyspnea. 12. Cactus grandiflorus relieves shortness of breathaccompanied by pressure in the chest. The remedy is indicated for pulmonary complications due to cardiac affections. 13. Mercurius solubilis relieves night attacks of breathlessness. 14. Pertussin treats bronchial asthma and whooping cough. 15. Sulfur is recommended when asthma alternates with gout. 16. Cuprum metallicum treats bronchial asthma. The cough is dry and suffocating. Person turns blue in the face and falls unconscious. 17. Ipeca relieves a dry, spasmodic cough that ends in gagging or vomiting. 18. Thuja is recommended when asthma sets in following vaccination.